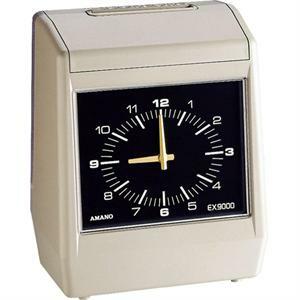 The Amano EX-9000 series electronic time clock is the most popular across-the-card or up/down-the-card column print-style time clock available - you choose which format best fits your needs. With the most features and an unsurpassed customer satisfaction rating, the Amano EX-9000 series time clocks are truly the best of the best. The EX-9000 series offers two great models to choose from (at the time of purchase - not upgradeable after market). The model EX9000 is semi-automatic with programmable lifts and adjustable imprint spacing while the EX9500 is fully automatic with programmable lifts and columns and adjustable imprint spacing and also contains 2-color printing capabilities and built -in signal relay kit. Automatic card feed with programmable day switch. Passive battery backup maintains time and program settings during power outages. Dimensions: 12.7" x 10.25" x 7"